Who would have thought that at 3pm the day before Mother’s Day that it would be nearly impossible to get a brunch reservation? And who would have thought that my mom – who greatly enjoys the comfort of her own home would want to go out on Mother’s Day?! I was screwed. Luckily mom loves my cooking so I was able to convince her to have brunch at our house with her grand-puppies (her words, not mine). The menu was ready in less than five minutes – Brie, sun-dried tomatoes, spinach and basil omelets with beach house hash, fresh squeezed OJ and Monkey Bread. I was instantly more excited to be enjoying breakfast in the backyard with Steve, Mom and the Girls. 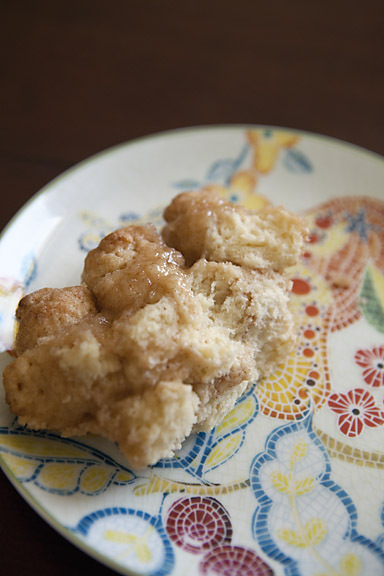 Monkey Bread was a tradition growing up in my house. Every Christmas morning my mom would whip up a batch and encourage us girls to help put it together. It was fun to make the dough into little balls and roll them around in a bowl of cinnamon and sugar. I always snuck one or two before they were cooked. I am a sucker for raw dough. As soon as that sweet, crispy, cinnamony goodness came out of the oven we would scarf it down like we hadn’t eaten in days. For about 25 years of my life I never knew that “Monkey Bread’ was a real dish. I always thought it was something that my mom conjured up for us kids. It wasn’t until Williams Sonoma came out with a Monkey Bread pan that I realized there was more to this bread than my wacky mom. With Monkey Bread dish in hand I set out to recreate fond childhood memories. But making new memories for my husband did not go exactly as planned. I spent an entire winter trying to recreate my mom’s recipe but failed miserably. My never-tired-of-sugar husband actually got tired of eating half burnt, half raw, stuck to the pan bread, but the father-son team that was doing concrete work in our backyard went crazy over it. The cold must have been getting to them…I eventually gave up and hoped that one day my mom would find the recipe. Fast-forward three years to Mother’s Day. I dusted off my WS Monkey Bread pan and brought out the big guns – my grandmother’s Betty Crocker Cookbook. I went right to the quick bread section for the never fail baking power biscuits recipe. The outcome was a perfectly cooked, delicious treat that filled me with wonderful childhood memories and was the perfect Mother’s Day treat for brunch and then for dessert as we powered through a marathon of The Deadliest Catch on the couch. Heat oven to 375º. Grease a bundt cake pan or a MB pan. Mix flour, baking power and salt in a large both. Cut in the shorting with a pastry blender. 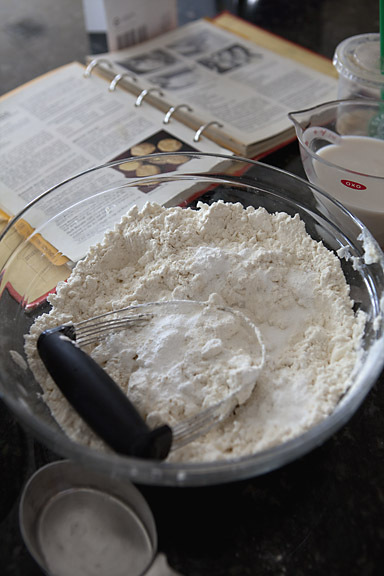 Add milk until the dough forms a ball when mixed. You don’t want it too wet or it will be hard to work with. 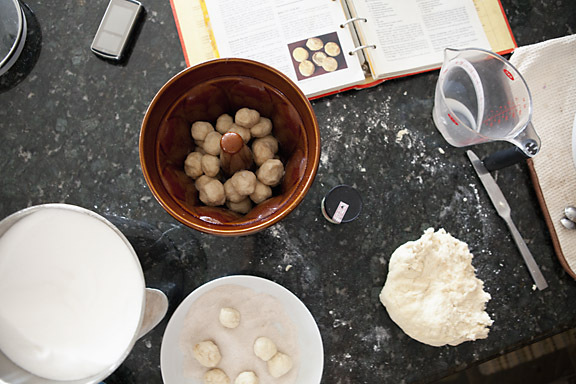 Turn the dough onto the kitchen counter with a little flour and knead about 10 times. In a separate bowl mix the cinnamon and sugar together. Pull off pieces from the dough, roll into half inch balls and coat with the cinnamon sugar mixture and plop into the bundt pan. 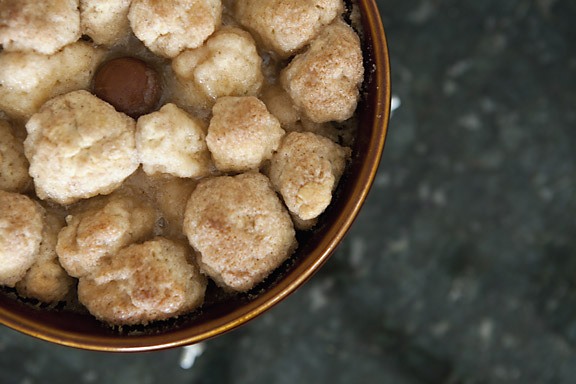 Mix the melted butter in with the remaining cinnamon, sugar mixture and pour over the top of the balls of dough. Stick it in the oven and cook for 40 minutes. Let cool for about 10-15 minutes and turn the pan upside on a plate to release the bread. Enjoy immediately. My hardworking husband treating himself to a coke and monkey bread after cleaning all the dishes. He really is a sugar-holic! What are Beach House Hash? These sound yummy. But, I have another question for you: what kind of shortening do you use? nothing great…I think what I used this last time was albertson’s brand. I really don’t use it all that often so i always have to check the expiration date when I do. Do you have a favorite? WOW! I can’t wait until you and Steve are in my neck of the woods again. I accept the challenge to outdo the sweetness of this recipe. I will dig into the depths of my deceased mom’s 1950 cookbook for the deep fried donuts rolled in sugar and cinnamon right out of the fat…and if your in the mood, I will cook them in bacon fat! I have no idea what a monkey bread pan looks like, or that is even really a thing, either. Now that I read your blog regurlarly (I love it!) I have more insight into Steve. I now appreciate more than ever how the site of a mountain of crepes and an endless supply of maple syrup would have appeared to you! I had no idea Steve was such an elf! Keep up the good fight! D! I bet those donuts are UNBELIEVABLE and I would be more than happy to have them or any of your cooking anytime! I really, really hope we come again soon. I want to bring my in laws. They would love it! I hope everything is well. I would to see photos of the garden so I can get very, very jealous! That depends, is there sugar in syrup…..? Fantastic! I make Monkey Bread but you don’t want to know how! Lets say it involves more of a box mix BUT I am definetely going to try this for Father’s Day morning.